JSON-B (JSR 367) successfully passed its Final Approval Ballot. So next to JSON-P 1.1 (JSR 374), JSF 2.3 (JSR 372) and JPA 2.2 (JSR 338) which has recently passed the Maintenance Release ballot, JSON-B is another Java EE 8 related specification that is final! In June, 3 additionals specifications have passed their Public Review Ballot and have then posted their Proposed Final Draft: Servlet 4.0 (JSR 369), JAX-RS 2.1 (JSR 370) and Bean Validation 2.0 (JSR 380). Those 3 specifications are now in the final phase, i.e. Proposed Final Draft, before getting finalized! 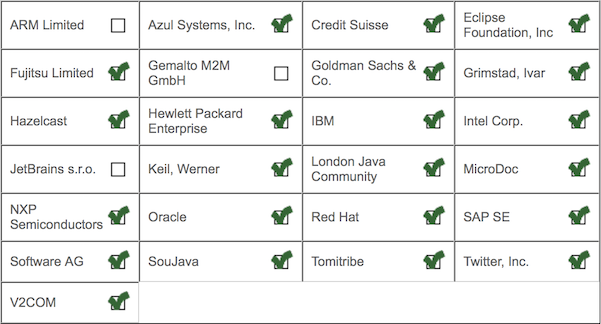 The Security API for Java EE Expert Group (JSR 375) has also posted the Public Review and is currently closing its Public Review Ballot period. The experts are busy wrapping the specification to submit the Proposed Final Draft shortly. And last but not least, the Java EE 8 (JSR 366), the umbrella specification has also successfully passed in June the Public Review Ballot and is ready to move to Proposed Final Draft! In summary, it is fair to say that Java EE 8 is progressing nicely! PS: If you are using Docker, make sure to check this Docker update covering both GF 4.1.2 and GF 5.